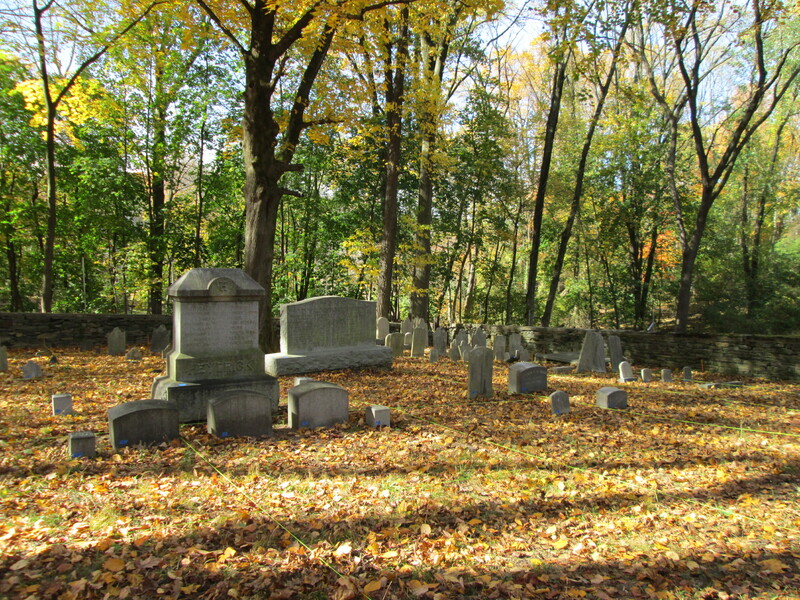 Back by popular demand,we will once again host tours of the cemetery to raise funds for the continuing preservation project. 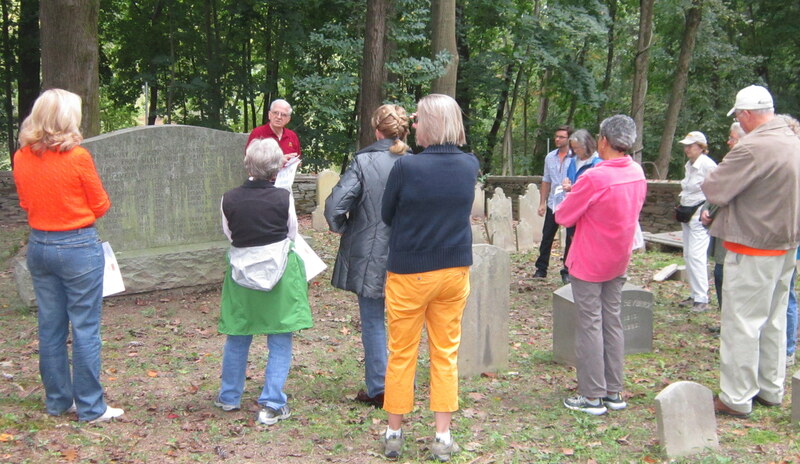 Jack Yeakel will introduce us to some of the residents of the cemetery and explain the significance of the site from its beginning before the American Revolution to its connections to landmarks we see today. Don’t miss this unique opportunity to visit this fascinating, little known historic site right in our own backyards. Please note that there is an uphill walk on a trail to the cemetery site, and can be difficult for those with mobility issues. Tour Date: Saturday September 19th at 1 PM and 3 PM. Visitors are encouraged to pre-register by calling 215-233-4600. 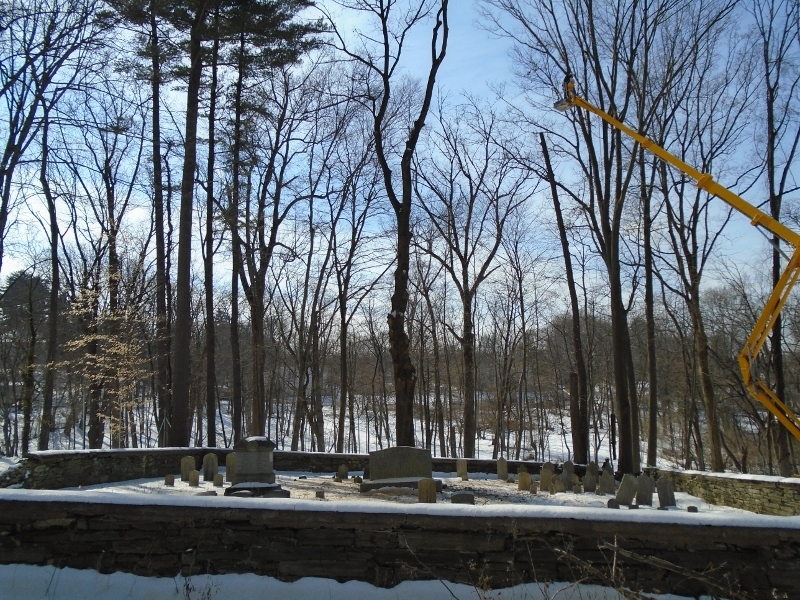 Having completed the tree work back in February, the cemetery was finally ready for some much needed site work. S.Vecchione Inc. of Oreland brought in several pieces of equipment to do the job. 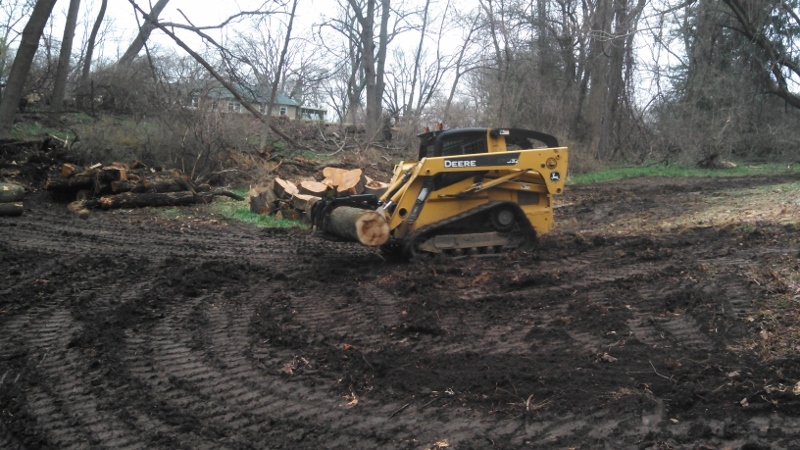 A mini excavator is useful for pulling out rotted tree stumps, compacting the back fill and moving small piles of debris. This tracked skid steer loader has an attachment that can grip logs. This machine was also used to re-contour the ground on the uphill side of the cemetery to keep rain water away from flowing into the stone wall and undermining the foundation. 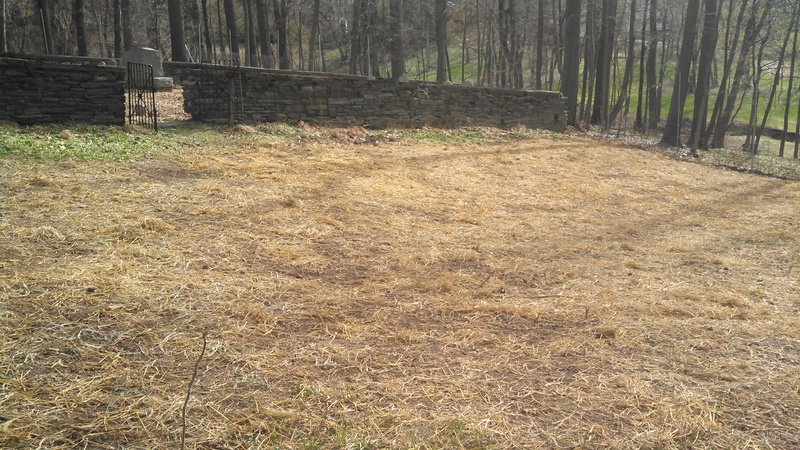 After fine tuning the final grade, grass seed and straw mulch was spread to minimize erosion. 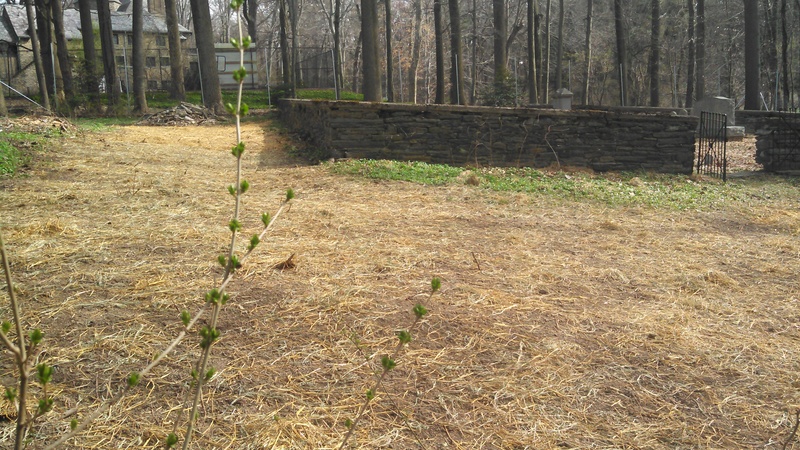 In about a month the site will be green with new grass. Special thanks to Tory Vecchione for bringing his equipment, experience, and professionalism to the project. A beautiful job! 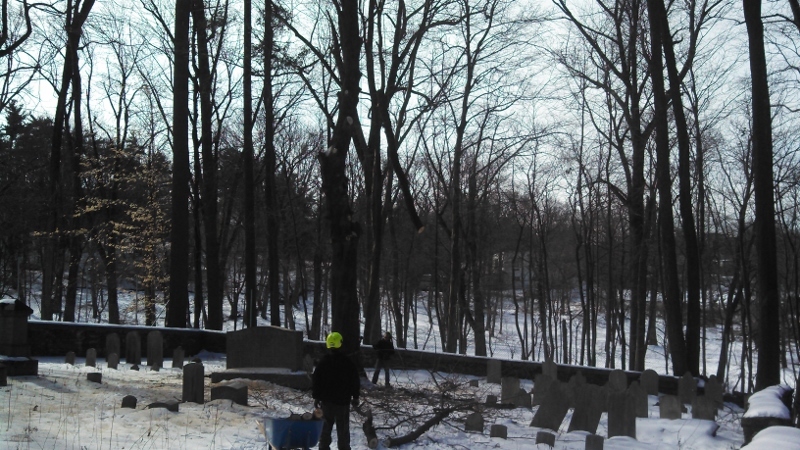 Eleven months after the completion of the Cemetery Survey and Condition Assessment Report we are able to begin the tree work. The work was delayed when we were forced to replace our original arborist. It took several months doing walk-throughs and collecting bids before selecting Cox and Company to do the work. Cox and Company used a tracked, self-propelled, high reach. 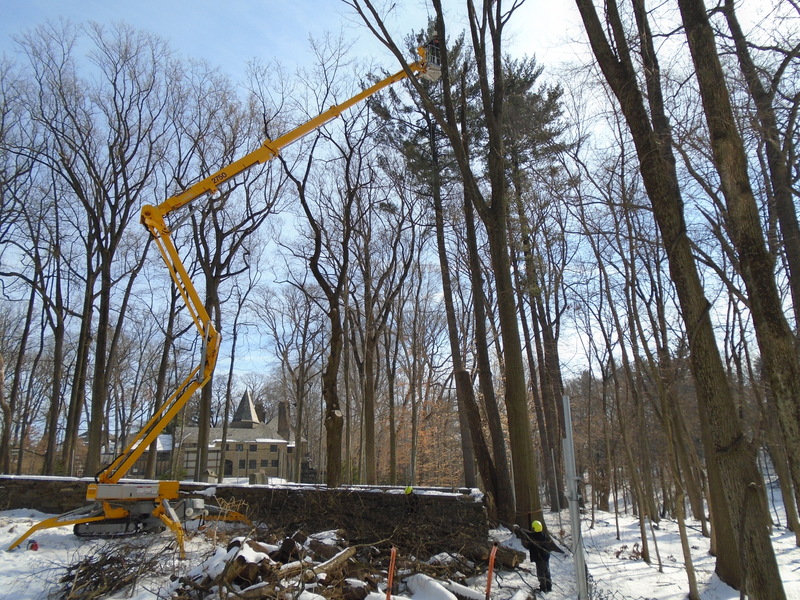 This special piece of equipment is well suited for sites that are tough to access and can easily reach the top of this 60′ Sassafras. 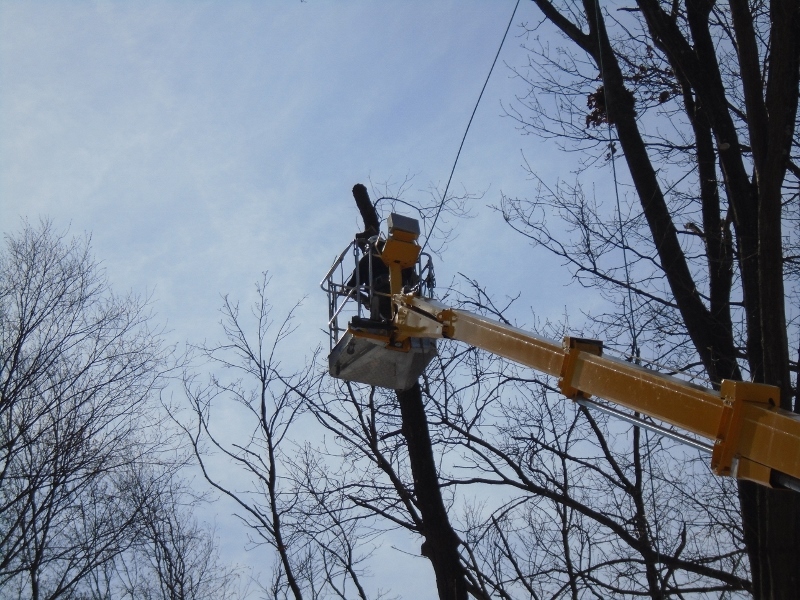 John Cox cuts the limbs of this 50′ Maple and uses ropes to lower them to the ground. The close proximity of the grave stones make this work quite challenging. The ground crew receives the limbs and carries them out of the graveyard. The boom on the high reach is long enough to extend deep into the graveyard while remaining outside of the cemetery walls. Any one of these trees could be blown down in a storm causing catastrophic damage to the cemetery. 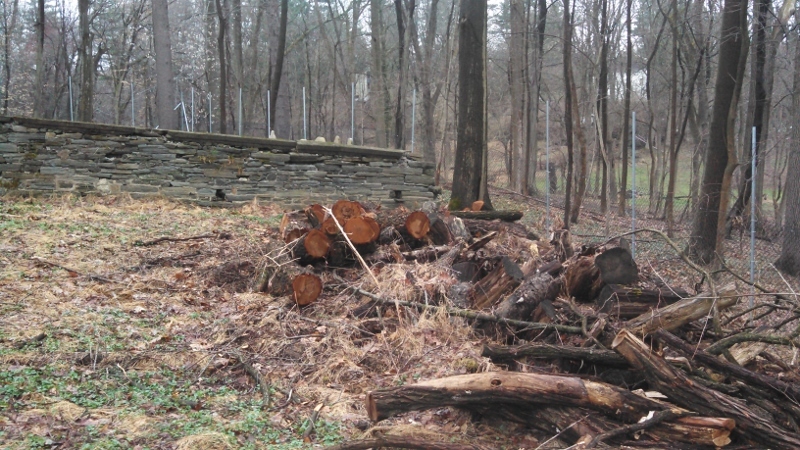 The removal of these trees helped to eliminate what was perhaps the cemetery’s greatest threat. Thanks so much to John Cox and his crew for a job well done! 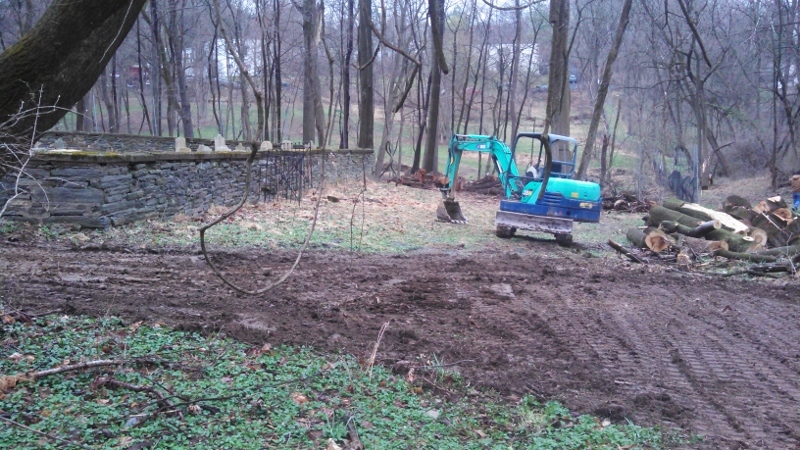 We are pleased to announce that work has begun at the cemetery! Using some of the $15,000 we have raised so far, we have started with Phase I of our preservation work. 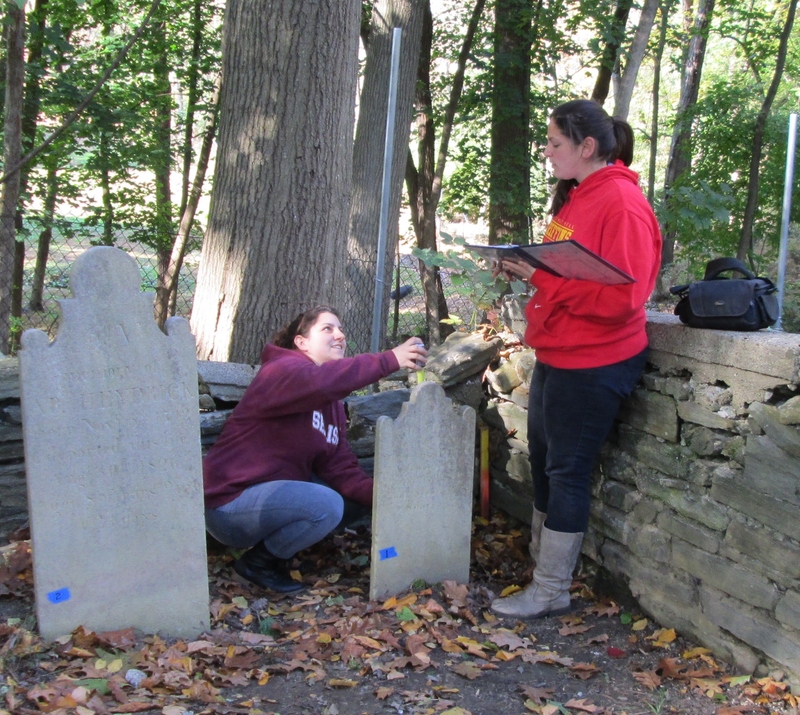 On Oct. 28th, Kreillick Conservation began the critical task of surveying the site. A team of conservators and student volunteers led by Scott Kreillick, laid out a grid of string lines over the cemetery. This grid was used to record the precise location of each monument and gravestone. 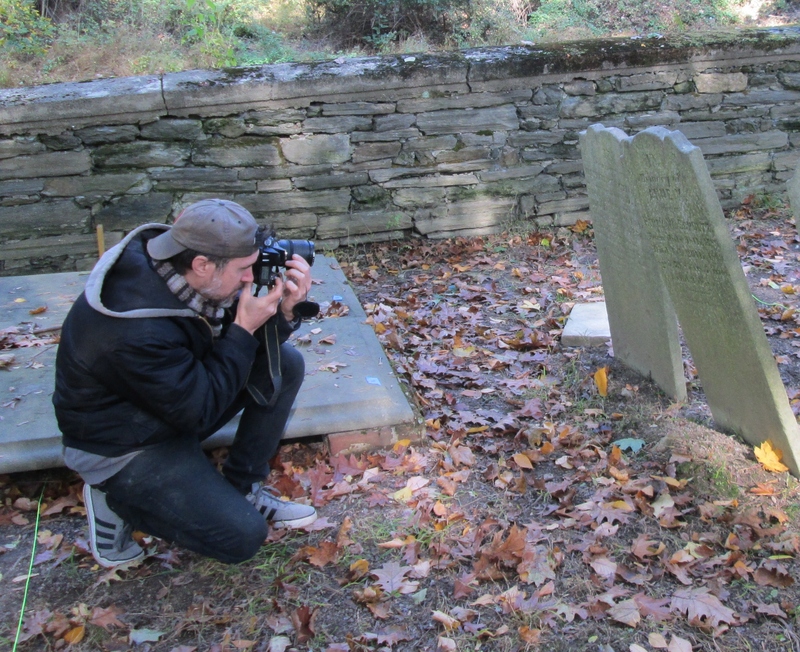 The team then numbered the stones, photographed them, and recorded detailed information for each one. They also assessed the condition of the stones and prioritized them to identify those that are most vulnerable. All of the data collected will be organized into a report that will be archived, ensuring the preservation of this precious information. If something bad were to happen, like a tree falling down, the report will help us put things back where they belong. Special thanks to conservators Scott Kreillick, Allison Kreillick, Gabriel Harrison and volunteers Mandi Rush, Shannon Anastas, Jillian Tugya. Please join us for a volunteer clean up as we prepare to begin Phase I of the preservation work. meet us at the cemetery on Saturday, October 19th from noon to 4:oo. 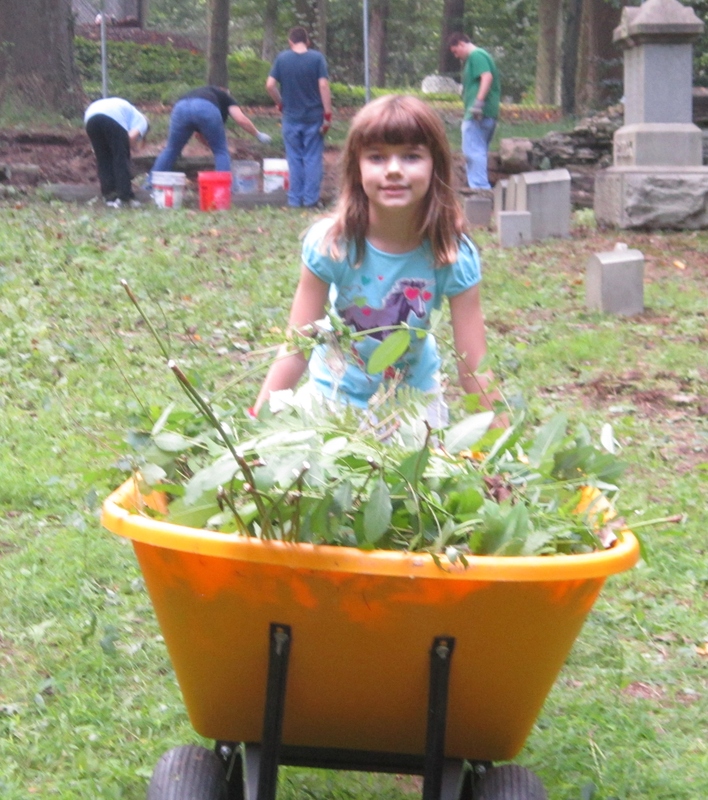 The work will involve pulling weeds, raking leaves, and removing debris from within the graveyard. The bulk of this work will be done by hand to prevent damaging the stones with power tools. Please bring gloves and wear long pants and sturdy shoes. Rakes, clippers and other hand tools will be provided but feel free to bring your own. Rain date is the following week October 26. We are looking forward to seeing you! Not just Yeakels. There are other family names within the cemetery. Researching who exactly is buried in the Yeakel Cemetery is a bit of a challenge. Clues are scattered and traditions are difficult to verify. 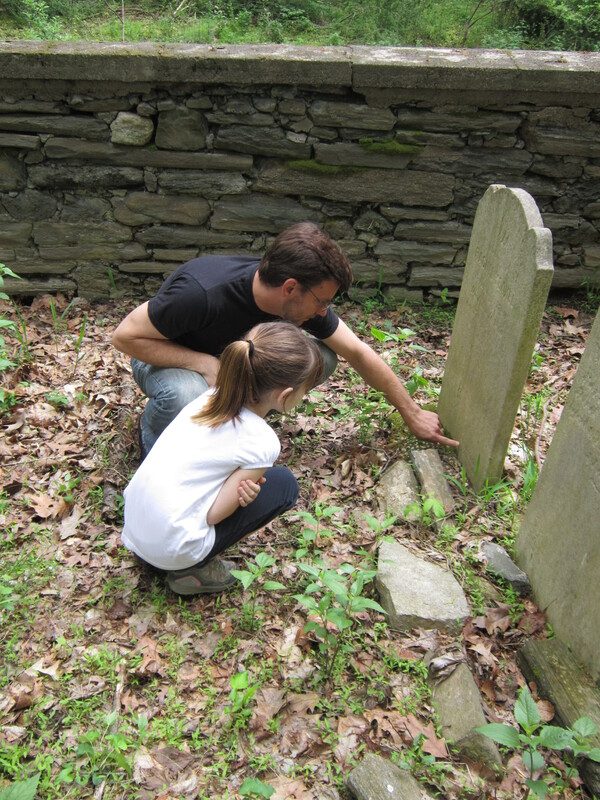 Tombstone research is the most reliable information we have (which is why it is so important to preserve!). Existing inscriptions, and transcriptions completed by researchers in the past, were used to create a list of burials that has just been added to this website. Some of the names were taken from the Schwenkfelder Monument and do not have individual grave markers. These represent the earliest burials. It is also likely that members of the Mack and Nice families are buried here. These families owned the property before 1802 and deed research indicates the land was used as a burying-ground before 1752. A Revolutionary War skirmish took place on this land in December of 1777. Tradition states that casualties from this battle are buried here, but that has not yet been confirmed. 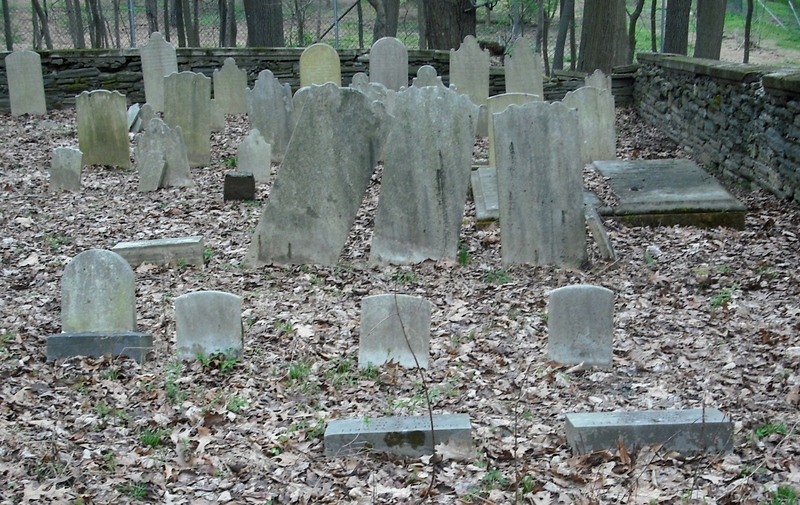 Perhaps some of the twenty-four unmarked fieldstones are the graves of some of these people. Please visit the Burials page to view the list. Look what we’ve been up to. 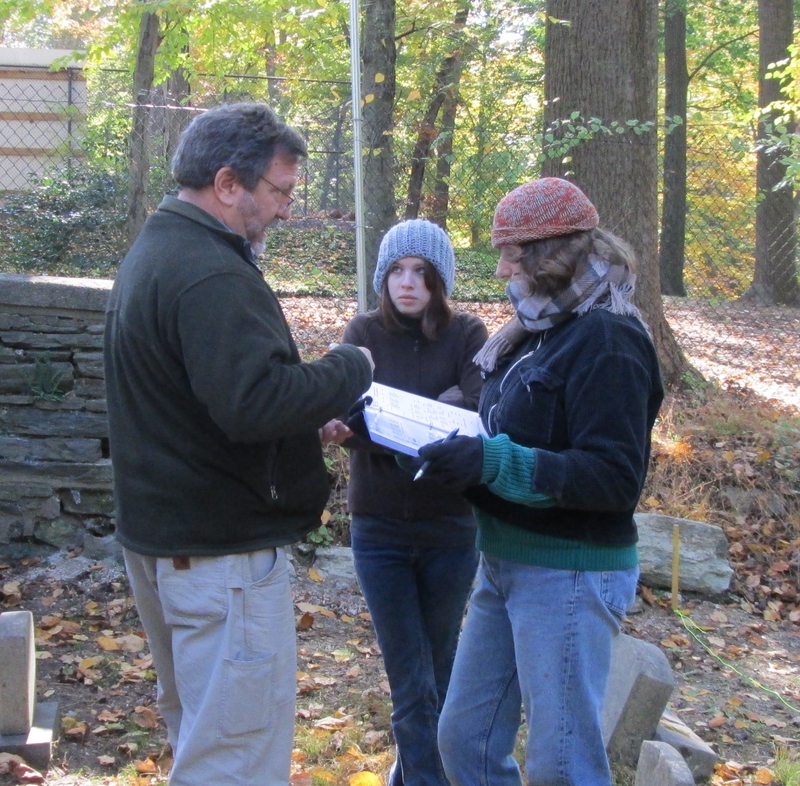 Over the past several months the committee has been working hard to develop a preservation plan for the cemetery. We have consulted with a conservator, a historic preservationist, a fundraising specialist and trades people. 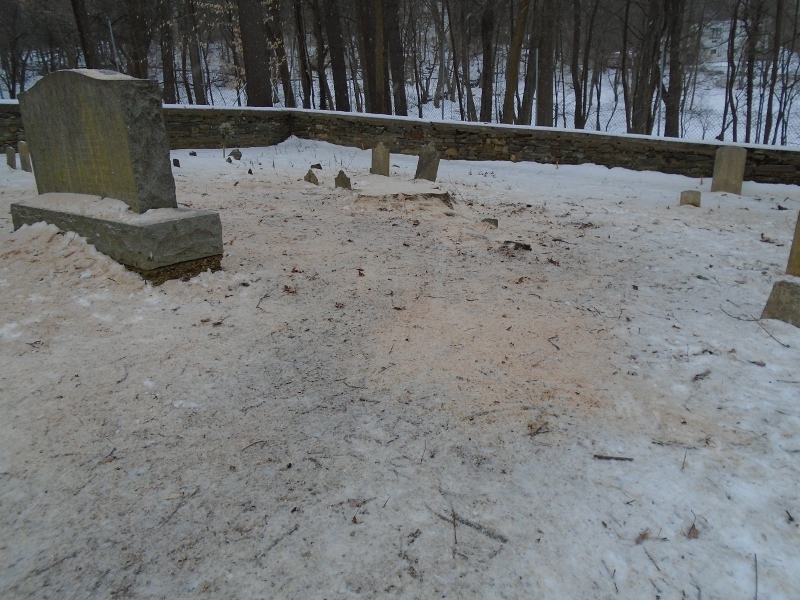 Being mindful of the historic significance of the site, we are carefully reviewing all of the detailed proposals to create a plan that addresses all of the cemetery’s needs while trying to control costs. One way to keep costs down is to use volunteers for some of the labor. Under the guidance of a professional conservator, these volunteers will aid tremendously in preparing a site survey, marker condition assessment, marker conservation and general clean-up. This type of program can be an educational experience for the volunteers and a means for community involvement. The volunteer event in September provided an estimated savings of over a thousand dollars in labor costs. We have also been planning for fundraising. The Central Schwenkfelder Church, who owns the property, has agreed to manage a fund for the preservation effort using their non-profit status. 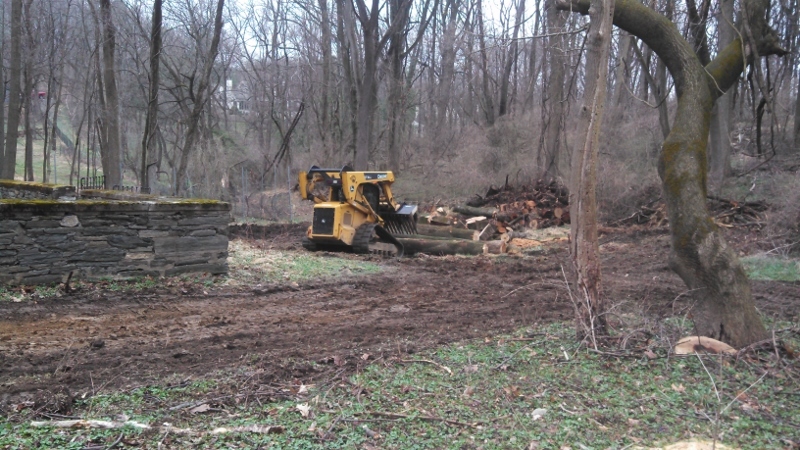 The church has already spent over $9000 removing dense brush and creating a stream crossing to provide access to the site. Thanks to them workers and visitors have a clear path to the cemetery. The rest of the work will require more money. We are close to establishing a budget and timeline and hope to reach out to the community soon to solicit funds. Another option to explore is a historic preservation grant. Generally, these are matching grants allocated to projects that meet certain requirements. The application process requires a lot of historical research and will take some time to prepare. I have been asked many times about who is buried in the Yeakel Cemetery. Having it’s roots as a private burial ground, there is no official record of interments, like there would be with an incorporated cemetery. However, research has provided much information. I am currently working on a list of names based on existing tombstones and genealogical data. Some of the early lists include names of burials that have not been confirmed. I will attempt to distinguish between the known and suspected burials and publish the list on this website. If you have any questions feel free to leave a comment on this site or contact me through email, my address is theyeakels@verizon.net .